In a town where mediocre seafood is very easy to come by, it’s nice to see that modern yet classic seafood restaurants still exist in Baltimore. Thames Street Oyster house located in Fells Point is quite possibly some of the best and freshest seafood you can find in Baltimore. Like most Fells Point establishments, the restaurant is small – narrow yet long in configuration with some outdoor seating. The interior is exactly what you would hope it to be; casual with neutral colors, having the bar and raw bar being the centerpiece. As you walk in the aroma of fresh seafood and beer immediately permeates. The staff is very friendly and was able to seat us within five minutes at 8:00 on a Saturday night. Once I saw the raw bar as we walked in, I knew that I was going to start the meal off with some oysters. Thames Street Oyster allows you to completely customize your own raw bar platter. There isn’t a minimum of each item you have to order and each piece of seafood is priced individually, a great concept for parties that can’t always agree. There are at least a dozen different kinds of oysters with varieties of scallops, shrimp, crab and lobster also available for your platter. 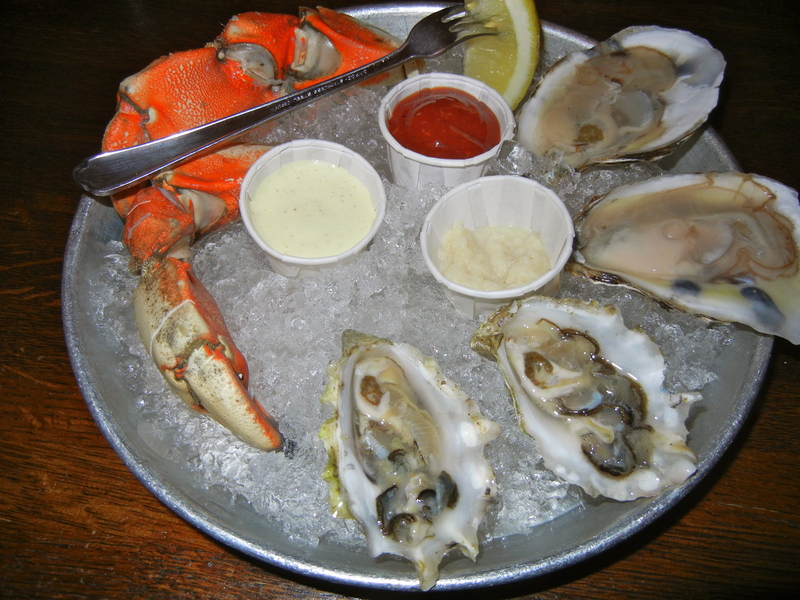 I settled on two blue point oysters (Virginia), two chef’s creek oysters (British Columbia) and two Jonah Crab claws. The platter came on crushed ice, with fresh lemon, lemon aioli, horseradish, and ketchup. The oysters were as fresh and delicious as could be. Both varieties were briny and salty with a creamy texture. The chef’s creek oysters were a bit more flavorful but were substantially smaller. The Jonah Crab Claws were comparable to Florida stone crab, but not quite as tasty. Regardless, the crab had a nice flaky texture with a naturally sweet aroma. The lemon aioli was a nice compliment with the crab. 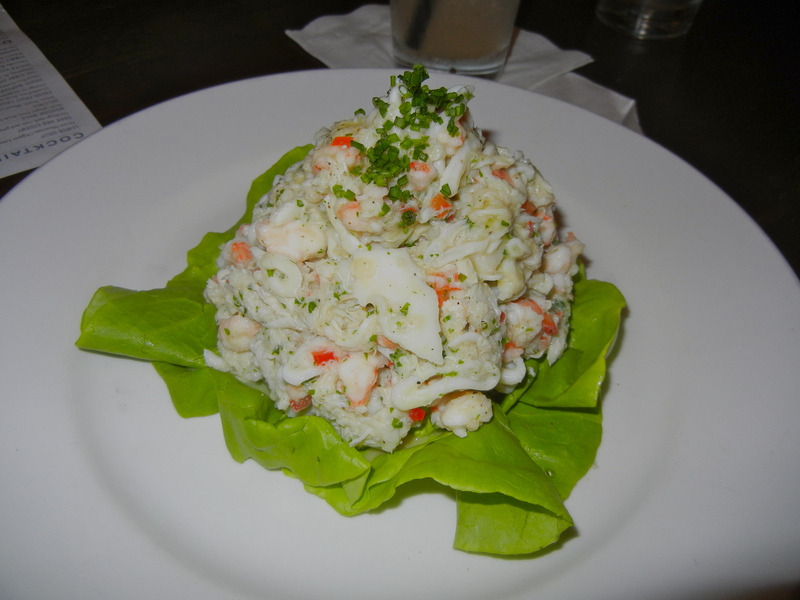 After seeing many other diners order the seafood salad, we decided to do the same. The seafood salad ($14) comes as a colossal heaping portion of crab, scallop, calamari and shrimp tossed in lemon vinaigrette. This salad truly blew us away. The freshness of each component with the tangy, yet slightly sweet, vinaigrette was absolutely unreal. I think we were able to polish off the starter in about three minutes, it was just that good. Main courses were very difficult to decide on, as any seafood lover will be mesmerized by the menu. As you would expect, almost everything is seafood served with a Maryland twist. Almost everyone in our party decided to order a sandwich because we were already so full from all the appetizers. The shrimp salad was unbelievably good, featuring gorgeous chopped shrimp with fresh parsley, lemon, old bay and some mayo served on a buttery hotdog style bun. The sandwich itself is difficult to eat because of how much shrimp they load onto the bun, but that’s one of the reasons why this place is awesome. 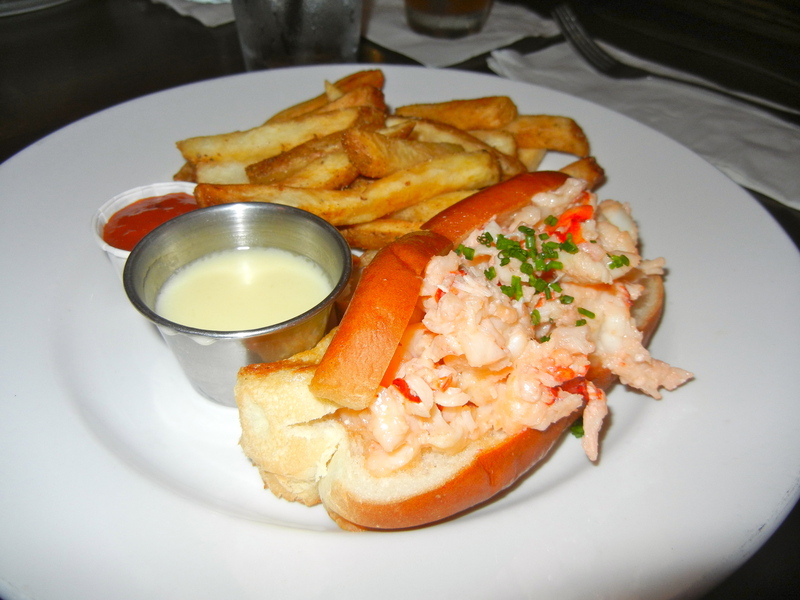 The lobster roll ($17) is served in a similar manner, except there is much less lobster on the sandwich. 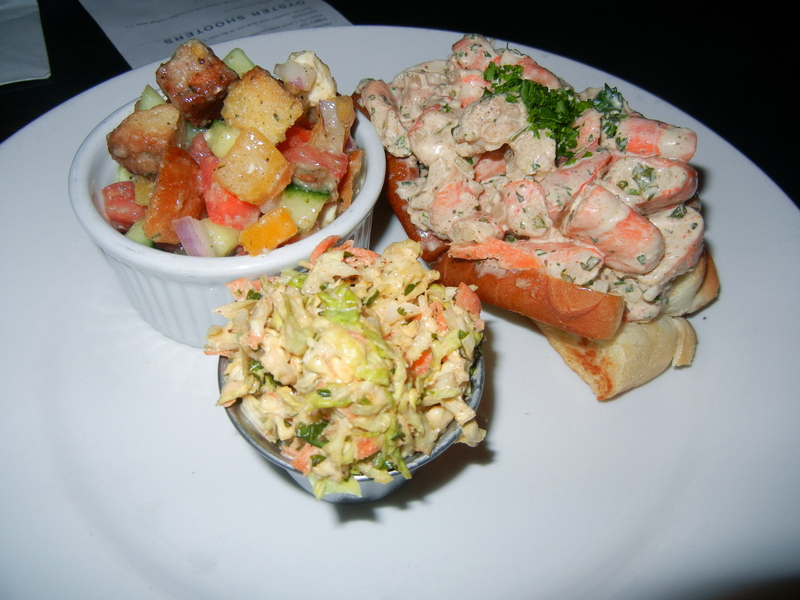 The lobster was sweet and succulent but not the best lobster roll I have ever had – still respectable nonetheless. 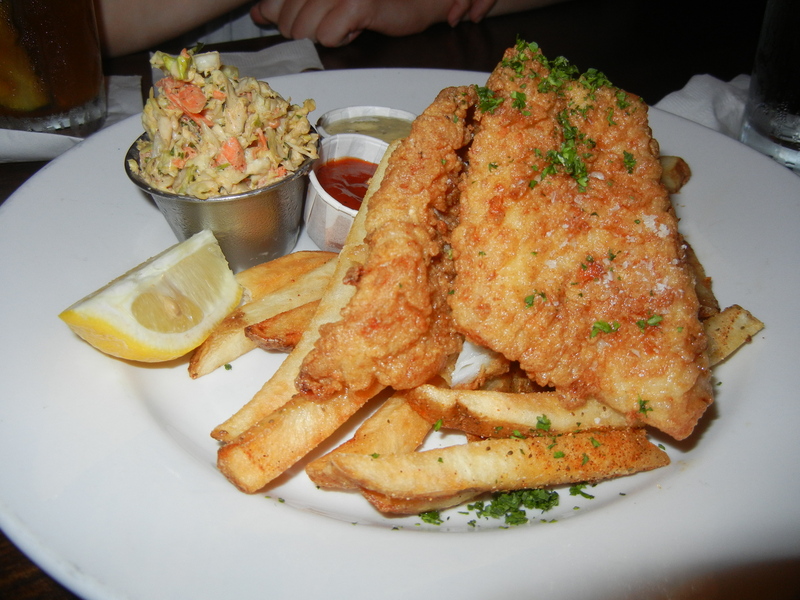 Our friend’s ordered the grilled mahi sandwich and the fish and chips. The mahi sandwich looked especially good and the fish and chips appeared to be classically prepared with minimal greasiness. I didn’t get a chance to try either but both looked very good, in fact they must have been because everyone finished all their food on the plate. Something noteworthy is I believe the ketchup at Thames Street Oyster is house made. It had a wonderful smoky flavor to it and genuinely tasted better than that regular red goop. Lastly, there were the desserts and drinks. I assume that the desserts are made fresh and change daily because our waiter verbally explained each of them without a menu. The peach cobbler was unreal. It was served warm with a scoop of vanilla ice cream. 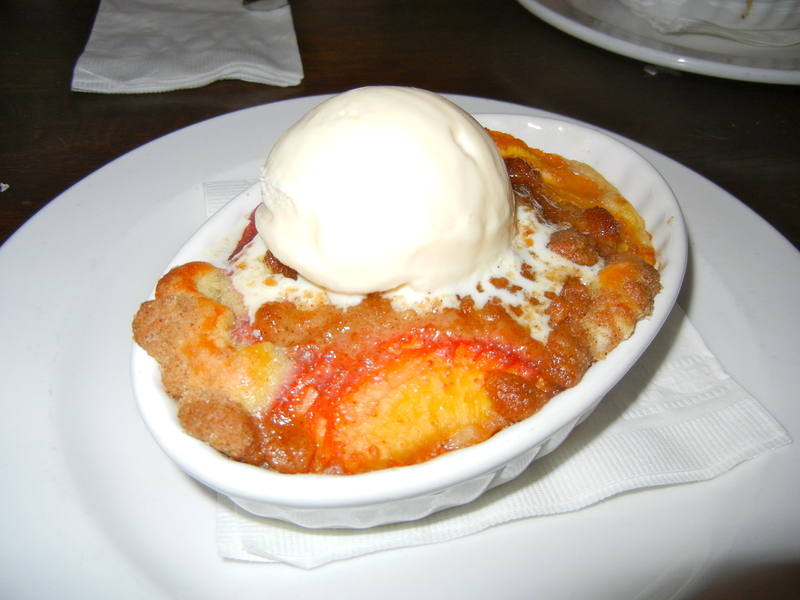 The chunks of peaches were perfect with the crunchy cinnamon cobbler pieces. The drinks are great, with many drafts available as well as Baltimore cocktails such as crushes and mules. The grapefruit crush was especially good and complimented all seafood dishes nicely. All in all, Thames Street Oyster House is one of the better meals I have had in Baltimore. The fresh seafood properly prepared in the casual yet warm environment is surely a hit. It also helped that our table was located right next to a TV, where we watched Jason Hammel go into the 7th inning without giving up a hit. The Orioles won that night and so did Tames Street Oyster House, I will definitely be back! Well Written. I do agree a tasty food in budget for all food and specialy sea food lovers.